It’s pretty odd how when you find one rare car, another two or three pop up at the same time. After featuring a B2 Passat Avant (known as the Quantum Syncro Wagon in the North American market, or QSW), another one popped up in substantially better condition, even if the color is not as attractive. 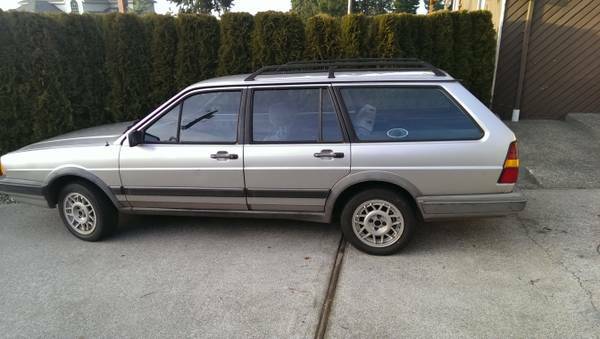 You can find this 1986 Volkswagen Quantum Syncro wagon for sale for $2500 in South Everett, WA (the same town, even!). Everett is clearly a QSW hotspot. Two grand too much for your collector car? Well, that’s where VW comes in – it’s the car for Volks like you. Once you get this close to the 3-digit range, things start getting a little doubtful. You start forgoing some systems you’d normally expect to work, or being much more accepting of cosmetic issues. And really, who needs a heater, or electric windows that go up *and* down? Just make sure to steam clean the interior if there are any suspicious smells or spots! 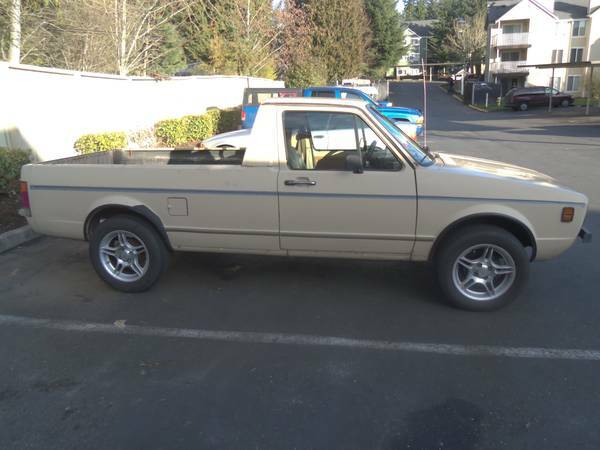 First up is this 1980 VW Rabbit Pickup for sale for $1000 in Puyallup, WA.